Note No 1 - Brexit: how might UK agriculture survive or thrive? Note No 2 - What's holding rural businesses back? Note No 3 - How can women achieve their full potential in the agricultural sector? Note No 4 - What role will there be for advisers in post-Brexit land management? Note No 5 - Production diseases and farm animal welfare: what does the public think? The Living with Environmental Change (LWEC) series of policy and practice notes draws out conclusions and recommendations from research funded by LWEC partners. No 33 How does the UK rely on water in other countries to produce our food? No 31 How can UK energy systems be made more resilient to the impacts of climate change? No 24 Critical metals for low carbon technologies: can future supply be ensured? No 9 What is causing the decline in pollinating insects? 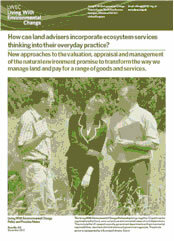 No 4 How can land advisers incorporate ecosystem services thinking into their everyday practice? No 3 Could advisers of land managers work more effectively across professions? No 1 Payment for Ecosystem Services: what does it mean for the future of our environment? A series of brief notes, drawing out the implications for future policy and practice from Rural Economy and Land Use (Relu) research. No 33 Could protected landscapes have a leading role to play in the sustainable management of natural resources? No 16 Policy-making for animal and plant disease: a changing landscape?